The Five City Spa Gift Voucher is the perfect gift for your loved ones who need a little “relax moment” in their busy lives. You can choose any treatment, such as the Full Body Massage, a Pregnancy Massage or even the Baby Massage Course. You can also opt for an amount on the Voucher (minimum EUR 30). The Voucher will be handwritten including the name of the receiver and a personal note (from you). We can send the Voucher, you will receive it within 2 days. 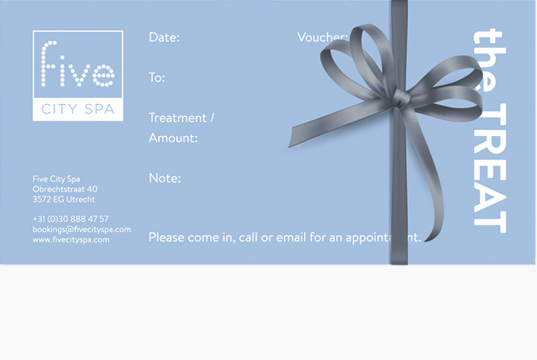 Or you can choose to pick up the Voucher in one of our spa’s. The Vouchers can be used for an unlimited time but only for the original value they were purchased for. The Vouchers can only be used for the location of purchase.